A UK tour in summer, a German tour in autumn as well as sporadic visits across to Norway and France over the course of this past year, should only be succeeded by a trip to Ukraine to top off a very exciting period for RiD. 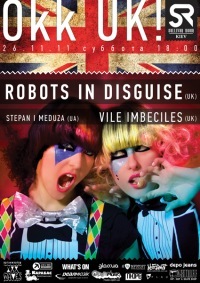 This will be the Robots’ first trip to Ukraine; who have appeared to have gathered an unlikely territory of super-enthusiastic fans: a surge of interest in the band soaring in the nation as well as the success of the latest album striking appeal in the capital’s music scene. RiD are playing on 26 November at the Sullivan Room, Kiev (Prorizna st. @ 18:00. Just can’t wait to see you in Kiev!!!!!!!!!!!!! What about Moscow? We’d love to have you here! and Madrid? Never comming here? i will upload anyway you can have the images. and i will ask someone to tweet you. Cant wait for the summer, The robots are always a welcome site!!! +1 for Moscow, please !